Read and discuss �How Grandmother Spider Stole the Sun�. Ask the children to recount the story, focusing on each animal�s individual characteristics and how its attempt to steal the sun changed the animal, according to Native American folklore. Explain that we are going to create a diorama, a piece of art which is 3-dimensional and which will illustrate a scene from the story. Everyone creates his/her own diorama of one or two animals stealing the sun, as described in the story. Students will understand how Native Americans passed information and tradition from one generation to another through stories. Students will understand the concept of a diorama, and that artwork can be 3-dimensional and does not have to be created on paper to be considered �art�. Each student will create his/her own individual piece of art that interprets the story. 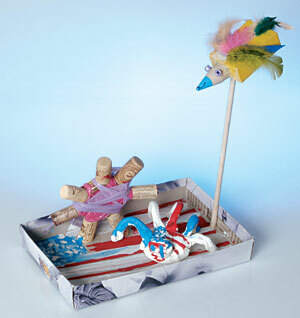 Students will successfully integrate a clay creation into a larger and different form of �art�, a diorama.